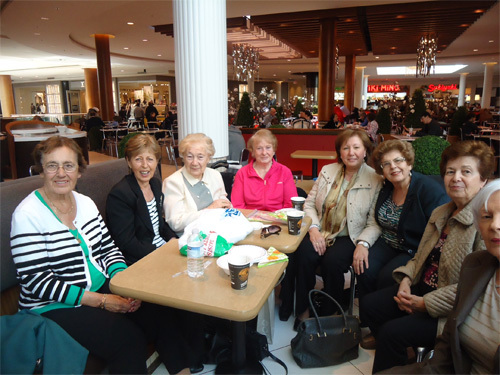 You can meet them at Rockland Shopping Centre, in the heart of Montreal's Mount-Royal suburb, every Wednesday afternoon. They are a large group, some 30-odd, with the women seated on one side and the men on the other. The gents reminisce about their youth and the glorious times spent fishing in Cape Cod or trekking north of the city to shoot deer in the Laurentians. The ladies talk about cooking while exchanging the latest recipes and go on and on about their children and grandchildren. The predominant topic, however, is Greece and the news and memories emanating from the homeland. Made up overwhelmingly of elderly Greek immigrants who left the Motherland after the war in search of a better life, this populous group, aged between 70 and 90 years, reunites every Wednesday to remember the good ole days and converse with each other in their native tongue. They are the architects of the Hellenic Community of Greater Montreal, having built its cultural centres, churches and local associations and having proudly laid the stepping stones for what is one of the most important Greek communities in the world today. They may be in the twilight of their lives and a fair distance from their roots but they remain eternally optimistic, regardless the severe back pain, or a wonky heart, or the fact their legs can barely carry them. Recently, Nikos Georgiadis, an integral member of the clan and owner of the legendary Rex travel agency, passed away. Through his office, Mr Georgiadis was instrumental in processing over 30,000 Greek immigrant visas to this country, thereby single-handedly being responsible for over one-quarter of the 116,300 Greeks who settled in Canada between 1946 and 1981. Emmanuel Dimopoulos, beaming father of three and equally proud grandfather of six, has become a regular, joining the crowd at the mall for the last three years. Mingling with his friends, he explains, "we meet here every Wednesday, remember the old times and have some joyful moments." Spyros Starfas, blessed with a refreshing sense of humour, claims they meet to "discuss several issues but mainly to check out the beautiful young women. We hang out with the guys I met in Florida a few years ago, where we fished some big ones. Now we see each other every week and we are reborn. We talk, we laugh and we exchange opinions out loud." For Constance Vasiliou, "Home Sweet Home" is on the island of Lesvos, in the Northern Aegean. "I go there every year to rejuvenate," she says. "I have a boat and sail and go fishing. It's nice to be there in the dear homeland." Everyone speaks of the desire to return to Greece for the summer, even though the financial crisis has dampened the spirits of relatives and friends on the other side of the Atlantic. "Regardless, Greece Never Dies!" they shout, remaining hopeful that the economy will snap back at some point and that the good times will return. 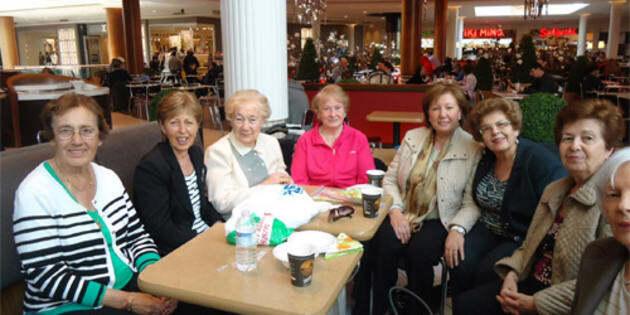 Their children are fluent in the Greek language but the same can not be said for their grandchildren. "You see, the younger generation loses the mother tongue no matter how big an effort we make. We speak Greek to them but, once in school, they learn French and English. The third generation is assimilating slowly but surely," everyone will agree. Someone mentioned that the children do not attend the Greek Orthodox churches because the service is not in English but others disagreed, insisting that it is the mixed marriages that are to blame. However, one thing is for sure. The Greek men and women of the "golden age" have never forgotten their hometown, recalling the days of their youth and empathizing with the problems of Hellenism today. They are fervent followers of the Greek news channels via their satellite dishes and constantly wonder what tragedy will befall their beloved homeland next. The ladies motion me to their side, filling me with tales of their triumphs in the kitchen and sharing their agonies about their offspring. Suddenly, I smell the sweet aroma of freshly made "loukoumades" in the air. An elegant woman approaches and offers the delicious little morsels of dough coated with honey and cinnamon made in the traditional Greek way. Each and every Wednesday, the protagonists of the wave of Greek migration to Canada in the '50s and '60s reunite at Rockland Centre to recycle their memories...in their twilight, until the curtain falls!